The latest issue of Luskin Forum, UCLA Luskin’s twice-yearly publication highlighting School projects and personalities, has been released. In this issue, readers learn about leadership development and career services programs, as well as a number of other ways students enhance their professional skills while studying at the School. Also included are news and event highglights, infographics and alumni updates. The magazine is mailed to homes of alumni and friends of the school and is also available via the document service Issuu. They presented their findings on May 19 to a group of more than 50 sustainable living students and professionals in an event hosted by the UCLA Ziman Center for Real Estate. The trip was inspired by Mayor Eric Garcetti’s recent Sustainable City pLAn, which aims to develop short and long-term strategies to address climate change and increase urban sustainability. The plan was modeled after Vancouver’s 2011 Greenest City Action Plan. Entirely student led and organized, the trip included stops to meet with government agencies, researchers, non-profits and other stakeholders working in different areas of sustainability to learn about their most successful practices that would be relevant for Los Angeles. Though the team analyzed several more Vancouver successes, they decided to hone in on seven that they believe Mayor Garcetti has already identified and are achievable today. The report outlines how the students encountered each lesson and how Los Angeles can successfully implement the ideas. Some of the objectives they identified included generating and distributing energy at the neighborhood scale to reduce greenhouse gas emissions, using data to drive policies that increase access to green space, and creating a space in City Hall to collaborate on design-build projects using the expertise of higher education institutions and graduates. Aaron Ordower, a second-year Urban Planning student involved in the project, said he enjoyed touring the LEED-ND Platinum Olympic Village, where the students were able to talk to urban planning students from the University of British Columbia and exchange ideas about how to improve sustainability in their urban communities. The visit taught them several conclusions about energy generation on the neighborhood scale. “Los Angeles should consider brownfield sites and other large redevelopment projects as opportunities for district energy generation. A local utility was made feasible because it was built in a new neighborhood, the Olympic Village,” the students said in their report. 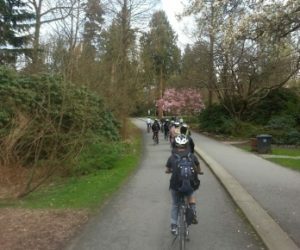 Ordower said he enjoyed experiencing the sustainable elements of Vancouver such as its seamlessly integrated bike planning and access to open space. The trip was sponsored by the UCLA Luskin Hildebrand Award for Canadian Studies, the Fulbright Canada-RBC Eco-Leadership Grant, the UCLA Center for Canadian Studies and the Liberty Hill Foundation. Ascending Public Policy student Crissy Chung has been awarded the LeadersUp Fellowship for the upcoming summer 2015 term. LeadersUp is an organization founded by the Starbucks Corporation and other major U.S. businesses in an effort to mobilize businesses into hiring young graduates, or “Opportunity Youth.” Through funding demonstration projects at partner businesses, the organization aims to demonstrate the viability of hiring young workers and tackle the growing issue of youth unemployment. Graduate fellows help monitor these demonstration projects, collecting data and measuring returns on business investment for Opportunity Youth. Their research acts as an important quantitative component of the program initiative: to provide results-based proof of the value of hiring Opportunity Youth. Chung is one of three graduate fellows selected for this program and will work through the months of June, July, and August 2015. UCLA Luskin celebrated the graduating class of 2015 Friday, welcoming 68 students in urban planning, 56 students in public policy and 101 students in social welfare to the ranks of its alumni. His words resonated with the audience of faculty, family and friends, who have watched UCLA Luskin’s graduate students develop as change agents over the course of their education. The invited speaker, newly installed Uber public relations executive Rachel Whetstone, brought in the perspective of a group not often mentioned on Commencement day — those who “don’t dream well.” Whetstone put herself in that category, and told the story of a career that proceeded not by some overarching grand scheme but instead progressed as a series of steps from college to internships to opportunities at various organizations. The ceremony was a mix of pomp and celebration, with a sense of impending change on the horizon. Dean Gilliam summed up the mood best through his quotation of, as he described it, a “classic of American Cinema,” the movie Friday. UCLA has launched a new magazine that aims to inform ongoing conversations on major public policy issues facing Los Angeles and California, serve as a public resource and highlight relevant campus research. UCLA Blueprint — written and edited by veteran journalists and astute observers of local and state government — debuted this week with an issue focused on public safety and criminal justice. The magazine is a partnership between the UCLA Luskin School of Public Affairs and UCLA External Affairs, whose public outreach programs facilitate the campus’s role in addressing societal challenges. Among the guests celebrating the launch of Blueprint was former California Gov. Gray Davis (left), standing with UCLA Chancellor Gene Block and Blueprint Editor-in-Chief Newton. About 125 guests attended the event at the Chancellor’s Residence, including community and business leaders, UCLA administrators and faculty, journalists and government officials. Among them were Los Angeles Mayor Eric Garcetti, former California Gov. Gray Davis, former Los Angeles County Supervisor Zev Yaroslavsky, Los Angeles County District Attorney Jackie Lacey, LAPD Chief Charlie Beck, City Controller Ron Galperin and Los Angeles City Councilmembers Gil Cedillo, Paul Krekorian and Bernard Parks. The event featured a wide-ranging conversation between Garcetti and Blueprint Editor-in-Chief Jim Newton, covering crime, the mayor’s extensive use of real-time data and metrics to monitor the pulse of the city, Los Angeles’ booming tech sector, the recent minimum-wage increase and other topics in the news. Newton is a former Los Angeles Times writer and editor of 25 years, the author of biographies on Earl Warren and Dwight Eisenhower, and a co-author of a memoir with Leon Panetta. He said before the event that the magazine is intended to strengthen UCLA’s ties to civic life and share faculty expertise in a way that serves the greater good. Replete with bold, attention-getting graphics, the first issue of Blueprint takes a sweeping look at criminal justice and public safety from a variety of entry points. Beck, the LAPD’s top cop, talks about how policing has changed. UCLA Luskin researcher Michael Stoll reveals what’s behind the surge in the U.S. prison population. UCLA psychologist Phillip Atiba Goff explains how he measures hidden racial bias in law enforcement. And in a Q&A, California Attorney General Kamala Harris talks about the biggest challenge she has faced in fixing the state criminal justice system. Newton said the debut issue addresses criminal justice and public safety because police use of force is increasingly in the headlines and because the topics are familiar to him — he covered the LAPD as a reporter for five years. In the discussion Wednesday, Garcetti reflected on the recent unrest in Baltimore and L.A.’s own problems. Blueprint’s second issue, due out this fall, will focus on economic and social inequality and include an interview with Joseph Stiglitz, recipient of the Nobel Memorial Prize in Economic Sciences, a Columbia University economist and respected author. Newton said he hopes the magazine will grow into a quarterly publication, and he plans to hold public events to extend the discourse around each new issue. Shawn Landres Named Civil Society Fellow The cofounder of Jumpstart Labs will work with students and researchers to better understand giving and civic well-being. 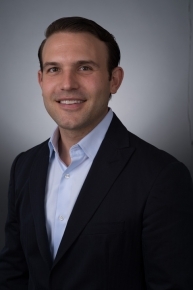 Social and civic entrepreneur Shawn Landres is serving as Civil Society Fellow in the UCLA Luskin School of Public Affairs for the spring and fall quarters, 2015. He is advising The Center for Civil Society on research, meeting with students and guest lecturing in classes, participating in outreach, and working with the Luskin Center for Innovation to develop a civic innovation summit during the 2015-16 academic year. Dr. Landres cofounded Jumpstart Labs, a Los Angeles-based think tank and infrastructure support organization known for its applied research on faith-based social innovation, and chairs the board of Hub Los Angeles, a social enterprise development center in Los Angeles’s Arts District. A member of the Los Angeles County Quality and Productivity Commission, he chairs its Strategic Foresight Working Group. Dr. Landres also co-chairs the Santa Monica Public Library’s Innovation Technology Task Force. Dr. Landres co-conceived and led Jumpstart’s six-part Connected to Give series, a nationally representative study of religion and American household charitable giving. He will be working with the CCS and the California Community Foundation on a study and forecast of giving and civic well-being across Los Angeles to be conducted during the summer of 2015. Dr. Landres holds degrees in religious studies and social anthropology from Columbia University, the University of Oxford, and the University of California, Santa Barbara, where he earned his doctorate. He is a member of the board of directors of the Association for the Social Scientific Study of Jewry. Dr. Landres has co-edited four books and published award-winning articles and essays that advance intergroup understanding. He has more than two decades of experience in academic, nonprofit, and philanthropic leadership, social entrepreneurship, network building, and organizational development. In 2009, The Forward named Dr. Landres one of America’s 50 most influential Jewish leaders. In 2012, the White House featured him as a “spotlight innovator” at its Faith-Based Social Innovation Conference and in 2013, the Liberty Hill Foundation honored him with its NextGen Leadership Award.